There are thousands of incredible local businesses all over the United States. Businesses in your city, community and neighborhood that we (ItsOnMe) do not know about. This program is designed to make it easy for you to introduce us to them. ItsOnMe Mission - Deliver local businesses the technology that supports the growth of their business without discounting their brand. To make it easier for the world to GIFT LOCAL and support the local businesses that make our cities so unique and special. Referral Program Goals: Make it easy for consumers and industry influencers like yourself to introduce the ItsOnMe platform and team to local business owners and decision makers that would benefit from selling gift cards from their website and social media pages. Businesses that would benefit from increased online revenue and the new customers a global gift card program would drive them. 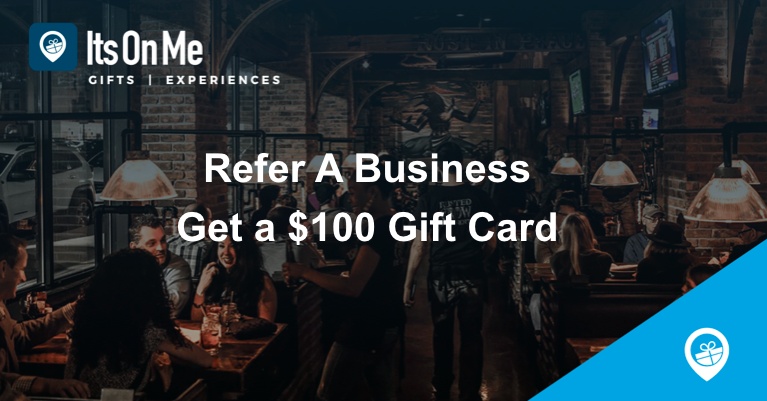 For every business that requests a demo and signs up for ItsOnMe you will receive a $100 gift card to. It’s that simple and easy to help both ItsOnMe and the business you are referring to grow together and our 300 annual gift card sales per year guarantee makes it a no brainer for them. Hi __________, Hope all is well! I came across a company names ItsOnMe working with some really amazing business from local neighborhood spots to James Beard and Michelin Star awarded restaurants. As I learned more about their business and the success their clients are having I thought of you. Simply put, ItsOnMe® makes it easy for a business to sell eGift cards from their website and social media pages driving a local business global revenue and new customers everyday. I noticed that you don’t have gift cards available on your website so this would definitely be a great opportunity. They even guarantee 300 online gift card sales per year. Great numbers. [Here is a PDF](https://book.itson.me/onesheet) they forwarded me and they have this really great ROI Calculator as well. I can introduce you to my contact their if you want or you can just email info@itson.me like I did.